ISRAEL AND THE TURK: ANKARA HAS NO RIGHT TO PREACH MORALITY……. – The Tundra Tabloids……. ISRAEL AND THE TURK: ANKARA HAS NO RIGHT TO PREACH MORALITY……. 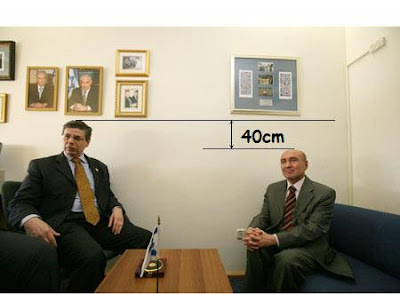 Danny Ayalon: Could we get him a small stool please? The Turks want their antisemitism to go uncriticized and then think that Israel should treat them as equals. Not this time around as Deputy FM, Danny Ayalon brings the Turk ambassador in for a literal dressing down. Of course the bed wetters will be crying foul and whine that that’s not how diplomacy should be handled, but why not? The Foreign Ministry responded Monday to criticism launched at Israel by Turkish Prime Minister Recep Tayyip Erdogan, and said that “the Turks have absolutely no right to preach morality to the State of Israel and the IDF”. Also on Monday, Turkey’s ambassador to Israel was summoned by Deputy Foreign Minister Danny Ayalon to receive an official reprimand for a Turkish television show depicting Mossad agents as baby snatchers. “The prime minister’s speech joins the broadcasting of the anti-Israeli and anti-Semitic Turkish television show, as well as severe criticisms being continuously and systematically launched at Israel for over a year now, since Erdogan attacked President Peres in Davos,” Foreign Ministry spokesman Yossi Levy said in a statement. Ayalon refused to shake Ambassador Ahmet Oguz Celikkol’s hand when asked to do so by journalists attending the official reprimand, and said in Hebrew that “we just want it to be seen that he is seated below us and that there is only one flag here”. In English, he told the ambassador that “unfortunately there is something we are concerned about, which I want to discuss with you without the presence of the press, in order to preserve discretion”. Previous Post Previous Post ABBAS ORDERS FATWA AGAINST TUNNEL DIGGING UNDER GAZA-EGYPT BORDER……. Next Post Next Post HOUNDED CHRISTIAN CONVERT FROM ISLAM SCARED FOR THE LIFE OF HIS MOTHER…….